companies. So there I was sitting eating my cake at my usual stop this weekend when I came across Sarto Bikes. Leaning up against the wall outside Kirkwood stores in East Sussex was a Sarto Bikes Davanti. 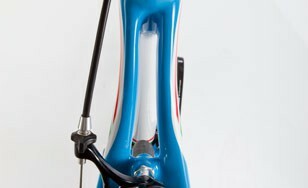 Distinctive with its red white and green Italian flag paintwork and Dura Ace groupset I was immediately drawn. Closer inspection shows the seat post as an integrated part of the frame it was clearly a custom build. Not long after its owner clip clopped back out of the shop and after a rather pleasant conversation whereby I learnt things like the company being in existence for 30 years, the owner Antonio Sarto (82) still being very much the patriarch and that all the frames were made by hand the beautiful Sarto disappeared up the road. I left knowing I had not only helped put the frustrations of the week behind me, but I had also learnt something new. Now that is what I call a ride! Whats in the stand: The Yeti 575, do they make the mech hangers out of butter? ← Evans Cycles – Internet prices, collect in store! Haajlluelh! I needed this-you’re my savior. Beautiful bikes indeed. Could you possibly pass that UK contact my way? I am looking at buying a Sarto (one of the models listed on the US site) in the UK but not having much luck finding out where I can actually order one! Thanks! Hi, I will dig it out for you. It involved meeting another owner who had bought id from a shop in London Bridge I think. I have the details somewhere.